Like my other recent read The Lives of Others by Neel Mukherjee, this book has as its backdrop the rise of Naxalite insurgent activities in Bengal following Naxalbari. Two brothers, Subhash and Udayan, two years of age apart but sounding like each other, have a comfortable childhood, stealing into the Golf Club, to collect golf balls and generally having fun in their neighbourhood. But as they grow up they go in different directions: Udayan, the younger but more adventurous one, becomes involved in student politics amongst the rising Naxalite rebellion, whereas Subhash goes to America to continues his studies. Subhash’s life in America continues to be intimately linked to his brother, his actions, his death and its consequences after Subhash seeing injustice in his own family takes matters into his own hands. Those consequences percolate through Subhash’s life, and the coming generations just as the continuing Naxalite activity affect that part of India still to this day. Taking action to overcome an injustice does not always lead to a better situation. Although Subhash marries his brother’s pregnant wife, Gauri, to free her from the marginalisation of his parents anger, his good intentions do not bring happiness. Everyone struggles through their grief and loss in their own ways, becoming the people they end up being because of it, flat lining their emotional responses in order to survive. 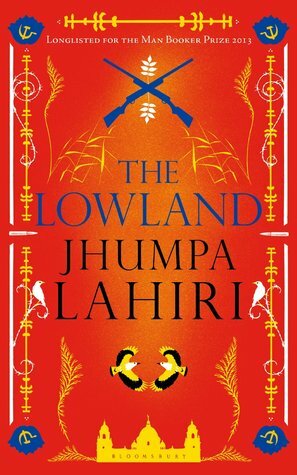 In many ways the title refers not only to the geographical lowland near the family home, where Udayan dies but to the lowland of the characters subsequent emotional horizon. Not until very near the end of the book do we really understand how his actions affected Udayan himself and thereby Gauri and how in turn this impacted her relationship with their child, Bela. The only emotional highs occur with Bela’s outbursts of anger at first Subhash, and later Gauri and it is only these that allow her the possibility of breaking the cycle of the family’s linkage and ties with the Lowland. Lahiri’s other book The Namesake" also about a Indian family living in America and is also about identity. There and here she writes very well about the minutiae of family relationships and this is where the strength of this novel lies. Reading this book took me on a trip back to India with memories of aspects of everyday life coming flooding back, those things which are different to everyday life here, even the Bengali words, recognisable from their Oriyan counterparts and from my landlady's first language, tiny things like the fact that house doors have padlocks on the grills and huge bolts on the inner outside door, of rice and dal rolled together into balls for eating, of phenyle for cleaning, and of the barsha kaal or kal bisaki as it was known where I was. These memories echo and reinforce Lahiri’s themes belonging and alienation, of place and displacement. Her writing just seeps into your soul as you read it and never leaves, a bit like the dampness of the Indian monsoon. ashramblings verdict 4* This book was shortlisted for the Booker Prize in 2013 and the 2013 National Book Award. Another good book from an excellent writer.